People always think about the cost of growing cannabis buds. At times, the cost might be the reason why people do not grow cannabis. However, you can cut down the costs by setting up efficient cannabis grow room. The only point is that you need to plan well. Planning is the key to make everything easy and reasonable. You need to consider all the necessary factors before setting up effective cannabis grow room. The grow room requirements may vary for indoor and outdoor grow room. The requirements also vary according to the size of the room. Before setting up a grow room, you need to decide the ideal place. Once you have chosen the place, you need to clean the grow room and make it ready for growing cannabis plant. The following points will assist you to establish perfect and productive cannabis grow room. The first-time growers have to think twice or thrice before making your decisions. First, you should decide how much cost you can spend on growing cannabis. You should look at your expenses and make sure it comes within your budget. However, spending a few hundred dollars today can yield better growth later. Adding insulation or updating the grow room may look expensive now, but it can save your future energy expenses and eventually will increase your income. Take enough time to figure out your grow room requirements and then set up your grow room accordingly. It is not needed to say that, light energy is important to grow cannabis. You can either use LED lights or HP lights. During the vegetative state, you can use LED lights as the plants do not require lighting at this stage. During the flowering stage, you can consider using HP lights as LED lights would not be effective at this stage. The initial cost of the LED lights may be more, but it can save on running the cooler and it requires less energy. Besides HP and LED lights, you can use ceramic metal halide lights. These lights can reduce energy consumption. Many growers fail to plan the exact space required to grow the cannabis plant. At times, they may overestimate the space. You need to determine how much space your cannabis plants require based on how much cannabis plants you want to grow. Your grow room must contain walking spaces to let you walk through the room to fulfill the gardening needs. No matter the size of your growing space, but make the most out of your space. 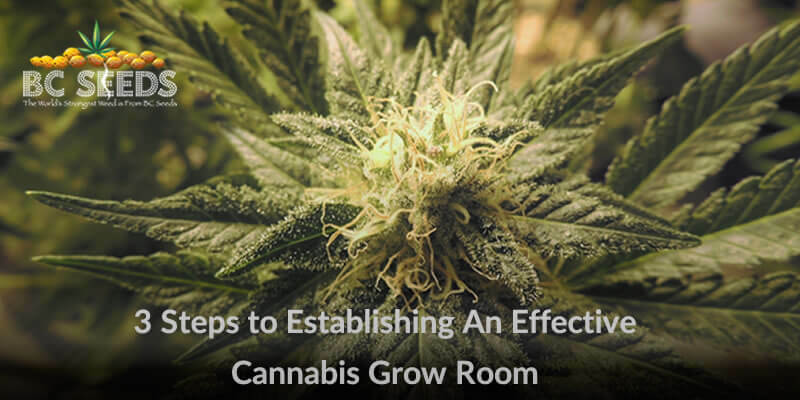 If you follow these steps properly, then setting up effective cannabis grow room would be easier for you. However, proper planning is the key to achieve this.